Decorative Life: About 4-8 days depending mainly on cultivar and harvest stage. Harvest at the 50% color stage for most cultivars. However, some cultivars and some growing conditions require that a more mature flower stage be harvested. For example, ‘Monte Carlo’, ‘Kees Nelis’, ‘Cassini’ and ‘Rosella’ lasted on average 12% longer when harvested mature verses immature when they were flowered in the Southern Hemisphere as so-called “ice tulips.” Tulip flower color depends greatly on local growing conditions. Treating bulbs with MCP prior to shipment and/or planting results in lower ethylene-induced problems such as gummosis. The more the air movement in areas where this species is being grown, the shorter the stem (peduncle) length. Native from Central Asia to Mediterrean area. Family relatives include lily, hyacinth, Ornithogalum and asparagus. Has goblet-shaped flowers with 6 petals (tepals), varying from slender and pointed to broadly rounded, one flower per stem, can be doubled, semi-doubled, and/or fringed among other possibilities. Leafless flower stems (scapes) are 12-18 inches long, one or two long leaves originate at base. Flower fragrance is slight with some cultivars. Store at 32-34F is preferred, up to 5 days wrapped, in water. If storing longer, place dry stems vertically. Flowers can be stored for up to 10 days if the bulbs are still attached. When they were held wet or dry between 32 and 50F, no difference in vaselife was noted between wet and dry at a given temperature. However, there was an advantage for wet holding when held at 55F. Therefore, dry storage/transport is recommended unless high temperatures (greater than 40F) are possible. The name tulip is the Latinized version of the Arabic word “dulband” (turban). Turkish men customarily wore tulips tucked in the folds of their turbans. The American Academy of Allergy, Asthma and Immunology lists this species as an allergy-safe pollen producing plant. During the 17th century in Holland, the popularity of tulips resulted in “Tulipomania” and bulbs were incredibly expensive and the subject of financial speculation. 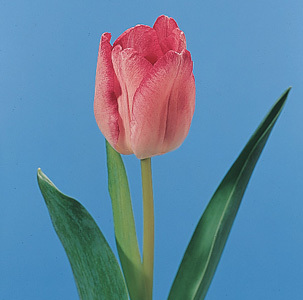 The most prized tulips were the “broken” or striped flower forms. This condition is now known to be the result of a virus infection in the bulbs. The many cultivars are divided into groups based on flower form including single rounded, double rounded, lily-flowered (pointed petals), parrot (fringed petals). The flat side of tulip bulbs will present the largest leaf upon forcing. With over 3000 species, the lily family includes many medicinal and food species in addition to ornamental species. According to Creasy (1999), fresh petals are edible. Can be used in salads (especially chicken or shrimp) or tea sandwiches. Using ‘Frappant’ and ‘ Apeldoorn’, van Doorn (1998) showed that the mucilage that comes from the cut stem ends of ‘Carlton’ daffodil is toxic to tulips. Therefore, don’t place freshly cut or recut daffodils in the same vase with tulips unless sufficient bactericide(s) is (are) present.